Test drive the Necron Overlord at the PC Gamer Weekender in London from March 5-6. Click here to find out more. I used to collect Necron miniatures because, not being particularly good at the strategy part, I could nevertheless make a proper nuisance of myself by not staying dead. 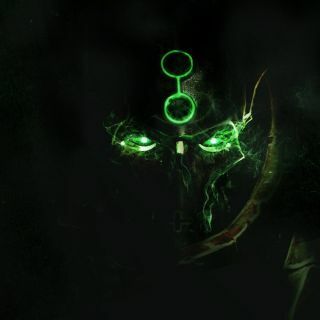 So, it's with excitement—and some disappointment that Relic wasn't teasing Dawn of War 3—that I see the Necron Overlord will be coming to Dawn of War 2: Retribution in celebration of its fifth anniversary. The Overlord will be a playable hero in Dawn of War's The Last Stand mode: three-player horde co-op. He's defined by versatility, battling in the thick of it as an area of effect specialist or from long range. A character isn't a massive update by any means, but the Overlord will be free to all Dawn of War 2 owners for the first five days from release. After that, he'll be $9.99, but the DLC is accompanied by a free patch that pledges to address longstanding community complaints and add new achievements. The Necron Overlord will be unleashed on March 10th, but if you'd like the opportunity to try him out before anyone else, you can pop on down to the PC Gamer Weekender this weekend, March 5-6, at London's Old Truman Brewery where he'll be waiting in the Sega Zone. Grab your tickets here—20% off with the code PCG20.